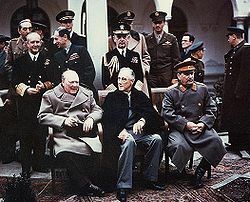 *The Yalta Conference between President Franklin D. Roosevelt, Prime Minister of the United Kingdom Winston Churchill and Soviet leader Joseph Stalin ends. *The Royal Air Force and the US Army Air Corp fire-bomb Dresden, Germany. Landmarks destroyed include the Frauenkirche, the Semperoper (the Saxony state opera house), and the Zwinger Palace. In the decades following the end of the war, some of the lost buildings will be reconstructed. *Among the American POWs on the ground during the Dresden bombing; Kurt Vonnegut. He later relates his horrific experiences in the novel Slaughterhouse Five. *This is a view of the skyline from the other side of the rail yards. 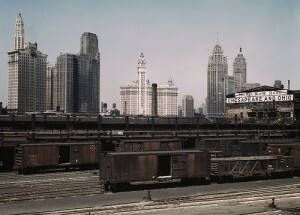 After a period of building during the 1920s, the skyline didn’t change much during the 1930s and 1940s. When the building resumes in the 1950s and 1960s, Chicago’s skyline will be altered dramatically. *Kim Novak turns 12. She is still known by her birth name Marilyn, and is looking forward to attending Farragut High. *Bill Veeck’s 31st birthday will not be his favorite. He is serving in the Marines and recovering from an injury that will cost him a leg. Price Check:Apples are 25 cents for 2 pounds, Bananas cost 11 cents per pound. At the Movies: “Objective Burma” starring Errol Flynn debuts in Chicago movie theaters. *Jack Lemmon celebrates his 20th birthday aboard the USS Lake Champlain. He is serving as the communications officer. *Two future actresses are born: Mia Farrow in Los Angeles, and Maud Wikstrom (who later changes her last name to Adams) in Sweden. Paul Erickson was a valuable member of the Cubs pitching staff in 1944; one of the team’s key relievers. He started a few games and pitched three shutouts, but manager Charlie Grimm prefers to bring him in from the bullpen. The 28-year-old righthander is known as Li’l Abner by his teammates. He’s a local boy (from Zion), who works in the off-season as a milkman in Chicago. As the Cubs get ready for spring training in French Lick, Erickson is holding out for more money. He will be among the last players to report, but when he does, he once again becomes an important part of the bullpen. He will appear in four different World Series games.